Iranians are still managing to send photos, mobile phone video and emails to the BBC's interactive sites, despite the Iranian government's attempts to close down all media communication beyond its control. You can find a list of some of the most popular websites where this material is being shared here . To find out more about the BBC's use of social media, read this editors' blog entry . Footage of pro-government militia firing on crowds on Monday dropped into the BBC Persian TV's inbox as Iranians contacted the BBC to complain about violence from the Basiji volunteer force. Neda emailed BBC Persian to describe what she saw, as crowds gathered near her house on Ferdowsi street in Tehran's Aryashahr district. "Demonstrators returning from the march joined this group and it was all very calm, but towards the end of the march, the Basijis started shooting at people." Several people complained about the subsequent official version of events. Siavash, who was at Monday's rally in Tehran, told the BBC "trouble was started by the Basijis, not by the 'thugs' as reported on state TV". Pirooz from Karraj, on the outskirts of Tehran, complained on BBC Persian TV's live interactive programme "Your Turn", at the government's labelling of demonstrators as "thugs and hooligans". BBC Persian TV says its presenters invite Mr Ahmadinejad's supporters to get in touch, but there has been little response. Government supporters' attitude to the BBC can be summed up by Sarfaraz, an Iranian based in London, who contacted the programme on Sunday. He accused the BBC Persian of "fomenting the unrest in Iran. It's all a plot by the British government to interfere in our affairs. They are the only ones who will benefit from this." Ali Rizvi is from a small village 170km from Tehran, who is now a student in Liverpool in the UK. He emailed to complain that the "100,000 people saying the voting was not fair represent a fraction of Iranian society. The rest are people like me and my family who voted for Ahmadinejad." Iranians are receiving telephone messages warning them not to step out of line. "Anonymous" from Norway emailed to say a friend in Iran had rung BBC Persian, without getting through. "Now she has received a message on her answering machine from Sepah [Revolutionary Guards] saying they know she has been involved in criminal activity - and now she has to report to the police." Fahimeh emailed BBC Persian TV from Shiraz, dismissing such warnings as random scare tactics. The words she described finding on her answerphone: "We know you went to the rally on Monday, if you repeat that again, we will deal with you" match those described in an email by Parinaz. People report Yahoo and Gmail being blocked and even their anti-filters slowing down. Change_for_Iran tweeted his concerns on the media clampdown to those trying to help: "Please don't post any proxy/tunnels here. We're being watched. Use direct messages instead." Outside Tehran, Arash rang BBC Persian TV to describe confrontations between police and reformist demonstrators in Esfahan. In the conservative city of Mashad, Mustafa told BBC News that Mousavi supporters were "scared, not brave like in Tehran". 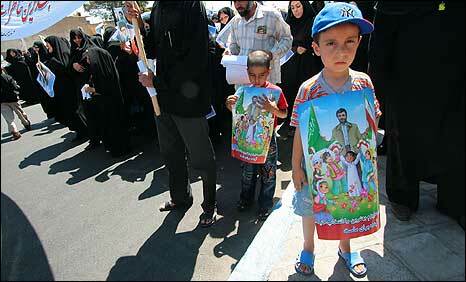 He said Tehranis had "safety in numbers".